Land Rover will bring seven electric Defenders to the Geneva Motor Show. The research vehicles have an air-cooled drive system, and while the concept won't enter series production, the fleet will get dirty in special real world trials later this year. 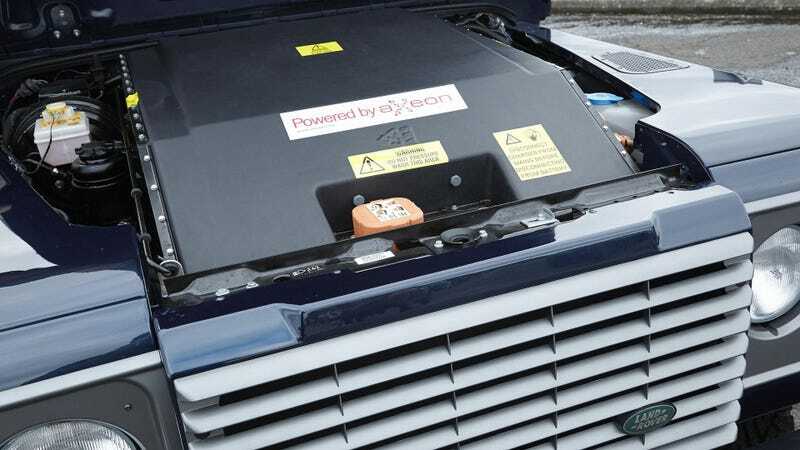 Instead of the standard diesel engine and gearbox, the Defender EVs have a 94 horsepower electric motor connected to a 300-volt lithium-ion battery with a capacity of 27kWh. Since the engine is producing 243 lb-ft of torque throughout the whole rev-range, there’s no need for gear shifting and the transmission comprises a single-speed, 2.7:1 reduction gearbox. Range is more than 50 miles while low-speed off-roading. The battery can be fully charged by a 7kW fast charger in four hours, or in ten hours with a portable 3kW charger. The powertrain is air-cooled to keep it simple and save weight, so the EV is only 220 pounds more than a basic Defender 110. Regenerative braking can produce 30kW of electricity, and the battery can be charged at a rate of up to twice its capacity of 54kW without reducing battery life. That means that up to 80 percent of the energy can be recovered, depending on conditions. Would you take a heavier Defender if it meant you got zero emissions?